Business and law are intricately related, and one discipline will always complement the other. Our JD/MBA—the oldest of Duke's joint degree programs—can be completed in just 3.5–4 years. You’ll engage in cross-disciplinary study, which gives you the tools to better serve your business clients in a legal setting or to leverage your legal knowledge in a business setting. Prospective students apply to each school independently. In addition to Fuqua's online application, applicants for Duke University's joint JD/MBA degree program complete an application form through the Law School Admissions Council's (LSAC) e-app service. The application is available in September of each year. While Duke Law students have less work experience, on average, than Daytime MBA students, their legal knowledge and internship experience from the first 1-2 years in law school add unique and valuable perspectives to the MBA classroom. Apply here for Duke Law. Gain an advantage for summer internship preparation and recruiting cycles and graduate with the same class you matriculated with at Fuqua. Take advantage of the opportunity to complete two business internships, which will be particularly valuable if you intend to pursue a business-focused job upon graduation. While you won’t be able to graduate with either the business or law class with which you matriculated, you may gain an advantage for building a broader network. The School of Law’s courses are usually held on a Monday/Wednesday or Tuesday/Thursday schedule. Both schools follow different academic calendars and semester schedules. Fuqua semesters are divided into two "terms" each. When scheduling a semester-long Law School course, be sure to consider both of Fuqua's terms so that there will not be a conflict. Tuition is a blended average of two tuition rates, paid every semester (regardless of where courses are taken). If you apply to both programs simultaneously, you will pay the blended tuition rate from the outset. If selected to be a scholarship recipient, admitted students will receive notification of the award on the second page of the admit letter. Financial aid will be processed through the School of Law. All admitted applicants are considered for scholarships, awarded on a merit and financial need basis. Information about applying for Duke Law scholarships will be sent to admitted students after they receive their offer of admission. Both Law and Fuqua offer robust career services to assist you in finding the right job. Your career goals—law or business focused—may influence your decision on whether to start at Fuqua after your first year of law school (business career focus) or after your second year of law school (law career focus). Duke Law holds on-campus interviews, or "OCIs." For first-year law students, the OCIs occur during the spring, while the OCIs for second- and third-year students begin before the fall semester. During the search process, Duke Law organizes a few days where firms come to Durham to interview candidates. The interested firms typically invite students back for second-round interviews, at which point a decision is made on an offer. The majority of law students receive their internship offers through this process, often culminating with full-time employment offer at the end of the internship. 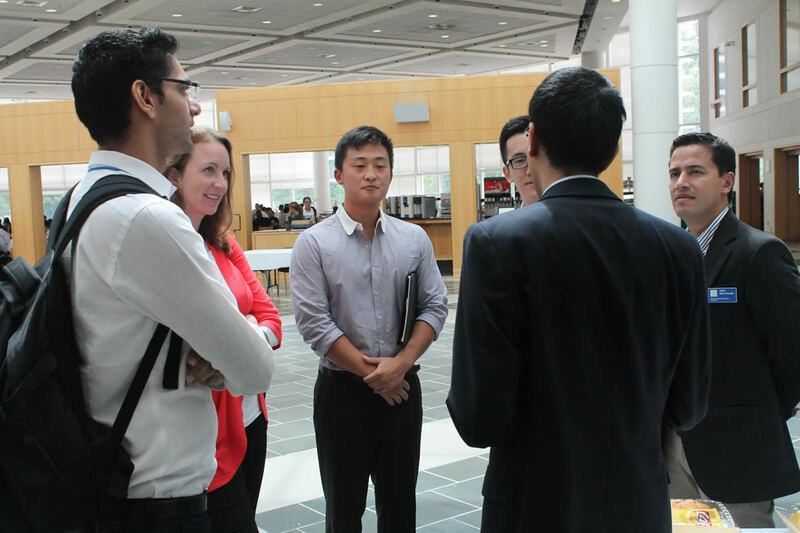 Conversely, Fuqua's on-campus networking and recruiting events occur as early as October each year, but the majority of first-year MBA students don’t interview for their summer internships until the spring semester. In many instances, networking—combined with a student's qualifications—determine whether a student is invited for an interview. Candidates usually then go through two rounds of interviews before an offer is given. In the business school, some students receive their offers off campus, and unlike in law school, many students choose to work full-time for a different company than the one they interned with over the summer. A JD/MBA candidate explains how she's leveraging dual Duke degrees to break into investment banking.